Portals are a powerful mapping feature which allow a variety of rendering effects; they allow an architectural surface to be used as a "window" which can display something besides the texture that would normally cover the surface. Anything from simple fixed plane, to another area of the map can be rendered within these surfaces via the same architecture. This is a simple map with no portal surfaces, and no portal window. 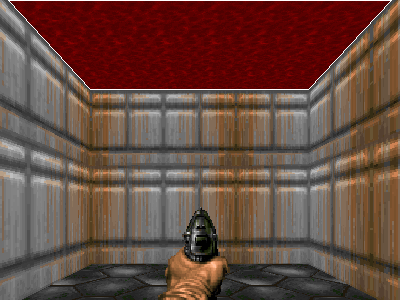 This is the same simple map with a fixed plane portal applied to the ceiling of the sector. The portal window is outlined in white. 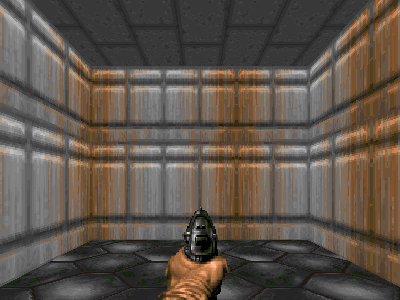 This is the map, but the same plane portal is applied to the ceiling and the far wall. The two surfaces display the same portal, and as such, they share a common portal window (also outlined in white). All surfaces in a scene that have a common portal will share the same portal window. A sector off of the main map area which is used by line or sector specials as a model, or as housing for lines which need to be a specific size. These portals produce simple rendering effects: based on floor and ceiling models, or using skyboxes. They're not interactive but can be useful for rendering skies or infinite extents at the edge of the map. Fixed plane portals (as the name implies) render a single, fixed plane into the portal window. The plane is always rendered at the same height and texture offset even when the camera changes its position. The front side sector of the special line is used to generate the plane. The ceiling texture, sector light, and ceiling texture scrolling are all used as attributes for the rendered fixed plane. The absolute height of the ceiling is used as the height of the plane. That is, if the special line front sector has a ceiling height of 64, the plane will always render at 64 units above the camera height. If the ceiling height is 128, the plane will always render at 128 units above the camera height, and so on. The left image shows a simple map with a small sector off to the side of the rest of the map. One of the lines in this sector has been given a 283 special which will apply a fixed play portal to all tagged sector ceilings. The height of the dummy sector is set to 128, the blue water texture FWATER1 is the ceiling texture, there is no scrolling applied to the ceiling, and the ceiling height is 128. The right image shows what the map looks like in Eternity. Notice the rendered height of the plane is the same as a ceiling 128 units above eye level. The line special 289 can be used to apply fixed plane portals to walls as well. 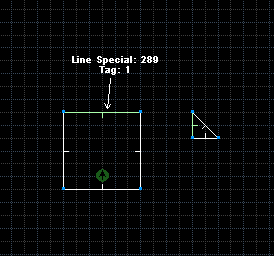 The special will find a portal with the same line tag and will display that portal on the surface of the line. The highlighted wall has been given a special of 289 and tagged to the portal line. In-game, the tagged wall now displays the portal. Note: The 289 line special works for all portal types. In UDMF, you still use a dummy sector, but instead of using classic specials 283-285, you use Portal_Define and give it a unique portal ID (to be sure, just use editor's "find new tag" feature or pick a large number such as 1000). Then select all sectors or linedefs where you want the portal to appear, and set their floorportal, ceilingportal or (for linedefs) portal UDMF fields to the same portal ID. Horizon portals display two planes which appear to go on forever until they meet in the middle (horizon). The plane coordinates are not fixed, and will appear to move with the camera. This can be used to achieve the illusion that water or grass goes off far into the distance without having to make overly large sectors. You can use classic types 286-288 or UDMF Portal_Define in a similar way to the plane portals. But much easier is to use classic 450 or UDMF Line_Horizon on a sector's walls to copy its floor and ceiling rendering into infinity. No tag or args needed for this. Following is an example using 286-288. 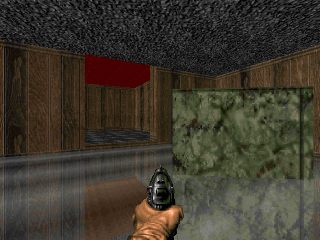 This map has a horizon portal applied to the ceiling and wall of the sector where the player starts. Both sectors have a floor height of 0, and a ceiling height of 72, but the floor texture in the dummy sector is set to a grass texture, and the ceiling texture is set to FSKY_1. This produces a field of grass which goes on into the horizon. If the camera moves up or down, the floor plane will appear to move along with it. If the ceiling plane had a regular texture on it, it would also move with the camera and appear to go off into the distance. Note: If the camera ever travels below the floor height of a horizon portal, the bottom plane will appear to move in the opposite direction of the camera movement until the camera is once again above the floor height. Skybox portals draw another part of the map into the portal window. The scene in the portal window will use the angle from the player camera, but will render the scene from the location of the skybox camera. This helps create the illusion that the contents of the skybox actually surround the map and are much larger in size than they really are. The front sector of the special line becomes the "skybox sector". This is not the only sector that gets rendered, but this sector is where Eternity will look for the skybox camera object which will be the point the skybox is rendered from. 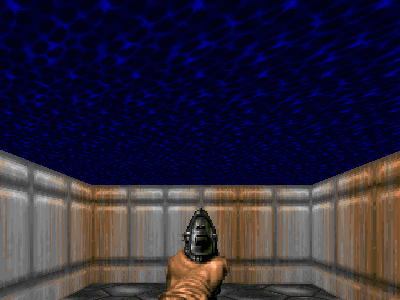 This map has a skybox portal applied to the ceiling and wall of the sector with the player start. The "Skybox sector" is the small rectangular one which contains the EESkyboxCam object. The camera object always spawns on the floor, so the skybox sector has been made a glass floor 48 units above the surrounding area so the camera will be above the floor of the box. The first image is the view in-game when the player no-clips into the sky box. The second image is the view from inside the main map area with the skybox portal applied. 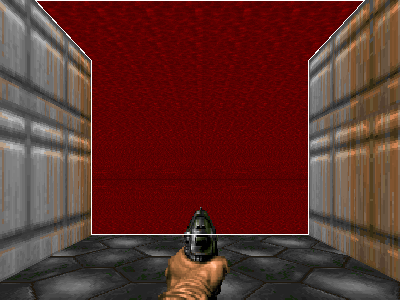 No matter where the player moves inside the map area, the skybox portal will always render from the location of the camera inside the skybox, however, the skybox is rendered from the angle the player is looking. ExtraData also provides a means of assigning a z-height to objects in maps. This could also be used to raise the skybox camera off the floor. If the skybox camera is left on the floor, the floor plane will not render and result in HOM. The skybox is not restricted to simple boxes. Any map architecture the skybox camera can see can be part of a skybox. Below is an example of a basic mountainous landscape created with map architecture. Anchored portals are those which render another part of the map on a window. They are of two types: purely visual, and interactive (historically the purely visual ones have been available long before the interactive ones, hence the separation). Interactive portals are also called linked portals and are the most important kind, as they allow extending gameplay to 3D (multistory) and even 4D/5D (discontinuous connections allowing "impossible" maps, albeit with some restrictions). Anchored portals are more complex than previous portal types. They are the base for linked (interactive portals). These portals however are not interactive; they're purely visual. Anchored portals will render another area of the map into the portal window, but the portal camera moves as the player moves, creating the illusion that the other area of the map is actually connected to the main area. This can be used to create the appearance of 3D architecture. Before use, however, an understanding of how these portals work is important. In order to piece the parts of a map together, an anchored portal needs to know how far apart they are. The distance is determined with the use of specific line specials. 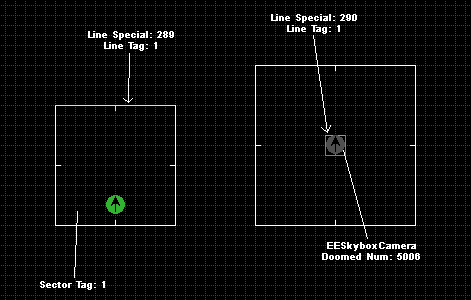 Each anchored portal needs a "portal line" (the line with the anchored portal special) which usually is area the portal should render, and an "anchor line" which is usually located in the main map area. 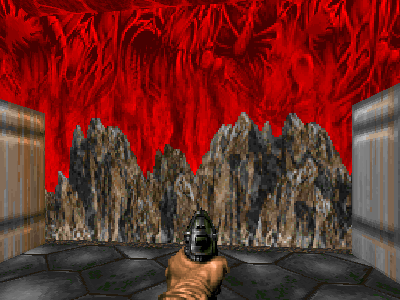 The distance and angle between these lines become the offset and rotation respectively, that is, how far Eternity needs to move the camera and rotate it from where the player stands to get the portal area. There are two different anchor line types so a different anchored portal can be placed on the ceiling and floor of the same sector. The two portals will share the sector tag. 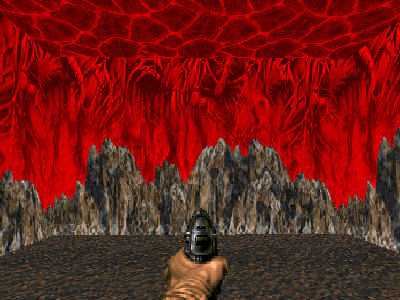 The above map has a single anchored portal applied to the inner sector of the area the player start is in. The "portal area" is to the right, and the "main area" is to the left. The view height is not changed, so the portal area needs to be set above the main area, or there will be HOM in the portal window. Note that no camera objects are needed for this effect. The portal will create a temporary camera automatically. In the example, the distance is 512 units to the east and 0 units north. 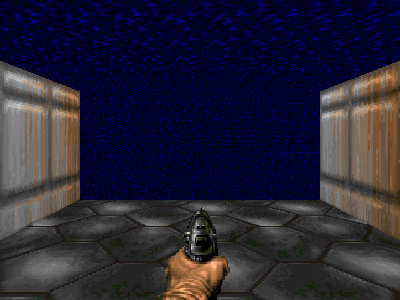 This set of numbers becomes the "portal offset" (distance between where the player stands and where the portal camera should go) and when the portal is rendered, the portal camera is place 512 map units east of the player camera, and the map is rendered from the portal camera. When paired with ExtraData lump, anchored portals can fake a reflecting floor / ceiling effect. Recreate an z-mirrored copy of the rooms you want to be reflected. Connect portals as you'd normally do. Enable ExtraData definition for a sector (i.e. give a 401 special to a LineDef facing the sector which flat's alpha you want to modify). Portals placed on a kind of surface can be copied into other surfaces: sectors or linedefs. 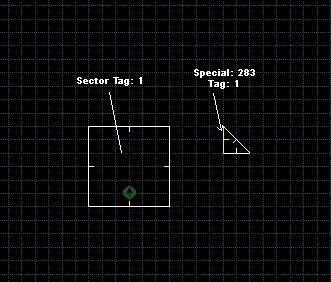 You can use linedef special 289 to copy a sector floor/ceiling portal into linedef's front middle part. Use the tag of a sector which has been given a floor or ceiling portal. You can use linedef special 385 to copy a like-tagged sector's floor/ceiling portal to the front sector. Useful when the front sector needs to have a different tag, and you don't want to add more control linedefs to address it. In this case, you can use this 385 special to copy the portal. This is what we sometimes call "edge portals", because they apply on upper and lower edges of a linedef (where normally such a texture is applied). They're always on the front side. A portal that resides on the back sector of the linedef can be copied, as an extension, to the front side's lower or upper part. On UDMF, use the upperportal and lowerportal boolean attributes of linedef. In the classic format, you need to use the ExtraData LOWERPORTAL or UPPERPORTAL extended linedef flag. If it's a linked portal, the side in the other layer should most likely have a standard wall portal leading back. In UDMF, give that linedef the portal attribute with the same value as the ceiling or floor's portal ID (ceilingportal, floorportal) of the containing sector. In the classic format, it has to be defined with classic special 376 (apply linedef linked portal) and the tag of this linedef. This page was last edited on 26 December 2018, at 04:43.